Pitzer was founded in 1963 as a women's college by Russell K. Pitzer (1878–1978), a California citrus magnate, philanthropist, and Pomona College alumnus. In April 1963, John W. Atherton, the dean of faculty and a professor of English at Claremont Men's College (now Claremont McKenna College) was hired as Pitzer's first president, and over the next seventeen months he recruited students, faculty, and trustees and constructed Scott and Sanborn Halls just in time for the fall 1964 semester. During the College's first year, students and faculty created the curriculum and the school's system of governance. The College graduated its first class of students in 1965 and became co-educational in the fall of 1970. The first academic term in the fall of 1964 began with eleven professors and 153 students from sixteen states and five countries. Pitzer's current president is the first African American to lead any of the five Claremont Colleges. The Rodman arboretum surrounds the Grove House at Pitzer College. Pitzer's campus is in Claremont, California, covering an area of approximately 35 acres (14 ha). The campus is located approximately 10 miles (16 km) west of LA/Ontario International Airport and Los Angeles can be accessed via Metrolink, with the station located approximately eight blocks southwest of campus. Access to campus is also provided via Interstate 10 and Interstate 210. The campus includes 16 buildings, including 5 residence halls. West and East Halls, which earned Platinum LEED certification, opened in fall 2012; three of the residence halls (Pitzer, Atherton and Sanborn) were built in 2007 and are Gold LEED-Certified. The Pitzer College campus occupies the northeast corner of the Claremont Colleges property, which contains seven institutions of higher education coordinated through the Claremont University Consortium. The Claremont Colleges include Pomona College (founded in 1887), Claremont Graduate University (1925), Scripps College (1926), Claremont McKenna College (1946), Harvey Mudd College (1955), Pitzer College (1963), and Keck Graduate Institute of Applied Life Sciences (1997). Currently, Foothill Boulevard/Historic Route 66 and Harvey Mudd College border the campus to the north, Claremont Boulevard to the east, Ninth Street to the south, and North Mills Avenue to the west. Possible future campus expansion into the Claremont University Consortium East Campus Property would extend the eastern boundary of campus towards Monte Vista Boulevard. At present, the campus is split approximately in half by Pitzer Road. Harvey Mudd College is adjacent to Pitzer's north, Scripps to the west, and Claremont McKenna to the south. Contemporary architecture characterizes the majority of Pitzer's buildings, several of which were designed by Gwathmey-Siegel following major donations from Eli Broad, a board member emeritus and former chair of the Pitzer College Board of Trustees. A notable exception is the Grove House, a California bungalow built in 1902 for a local citrus grower during the height of the Arts and Crafts movement. The building, a popular campus hangout, was purchased for $1.00 and moved to Pitzer in 1977 under the direction of Professor emeritus Barry Sanders. The Grove House is home to a cafe, the Women's Center, the Hinshaw Gallery and the EcoCenter. The John R. Rodman Arboretum is part of the campus, and most landscaping follows principles of xeriscaping. Several varieties of citrus and other fruit are grown throughout campus and an organic community garden, dedicated grove and chicken coop are located north of Mead Hall. The George C. S. Benson Auditorium (originally Avery Auditorium) was completely renovated in 2010 and is designed to accommodate classes, panel discussions, lectures, film screenings, dance and musical performances and more. The Stephen L. Glass Commencement Plaza is located on the southwest edge of campus. Nearby beach volleyball and basketball courts opened in April 2010 and the first commencement was held on the new Commencement Plaza in May 2010. W.M. Keck Science Center is shared by Pitzer College, Claremont McKenna College and Scripps College. The Keck Science Complex II is located on the southwest corner of the campus, formerly the Sanborn Parking Lot. Consisting of four modular units, the complex opened in fall 2011 and house science labs, classrooms and offices. In the future, a second Joint Science building will occupy this space. A greenhouse, which houses the work of the Ferre/Marquet Vaccine Research Center at Pitzer College, is located northwest of the Grove House. It was completed in summer 2010 and work began there in fall 2010. The main dining hall is in McConnell Center and features an award-winning executive chef, organic and local ingredients and vegan and vegetarian options. The Pit-Stop Cafe, opened in fall 2009, serves organic, fair-trade coffee and espresso drinks, plus sandwiches, salads and pastries. The Shakedown Cafe, located in the Gold Student Health and Wellness Center, is student-run and features organic world cuisine. Located directly northwest of the main campus, the Robert J. Bernard Biological Field Station, a resource of The Claremont Colleges, is an 86-acre (35 ha) nature preserve consisting of coastal sage scrub. 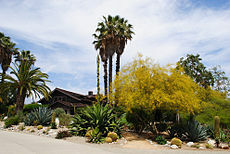 The Outback Preserve, located in the northeast section of campus, occupies just over three acres of the John Rodman Arboretum. The Preserve is home to one of the rarest ecosystems in the world: Alluvial Sage Scrub. Undergoing ecological restoration as part of the Outback Restoration Project, the Preserve is a living-learning laboratory. The project seeks to restore the Outback Preserve to a more intact alluvial sage scrub ecosystem, removing invasive plants and ensuring the success of native species. Each semester there are a small number of courses utilizing the Outback Preserve. Courses are open to all students at The Claremont Colleges. The campus lies less than five miles (8 km) south of the San Gabriel Mountains, on top of the alluvial fans that come from nearby San Antonio Canyon. The campus is relatively flat, with a 4% uphill grade from southwest to northeast. Mount Baldy, officially called Mount San Antonio, is 15 miles (24 km) north of the College and is visible from the campus. The Mount Baldy Ski Lifts are a popular spot for students to ski in the winter. On clear days, the Chino Hills are visible to the south and San Bernardino Mountains to the east. Pitzer owns and operates a 145-acre (59 ha) field station on secondary growth rainforest, the Firestone Center for Restoration Ecology. The facility is located approximately two kilometers east of Playa Dominical, Costa Rica. The property borders the Hacienda Barú nature reserve. The Center is home to programs in Pitzer's science, language and international studies curricula. The U.S. News & World Report College and University rankings 2019 edition ranks Pitzer College as the 41st best national liberal arts college overall. In 2015, Pitzer was recognized nationally as the 8th most selective liberal arts college; 20th most selective among all college and universities; 44th in best freshmen retention rate and 55th for highest proportion of classes with fewer than 20 students. In Forbes' 2019 college rankings, Pitzer was named the 69th best college in the nation. In addition, Pitzer was named the 56th best private college, the 27th best Liberal Arts University, and the 11th best college in the West. Pitzer earned an A for Campus Food from Niche and a Perfect 10 for Greenest College in the Country from College Prowler. College Raptor ranked Pitzer as the "Hidden Gem" among small colleges in California. Newsweek ranked Pitzer College #11 nationally in "Most Service-Oriented Schools" in its College Rankings 2011. In addition, Pitzer ranked #2 in "Best Food," #5 in "Top Schools for Activists," #6 in "Happiest Students" and #7 in "Free-Spirited Students." As a member of The Claremont College Consortium, Pitzer students have access to nearly all facilities available to students enrolled at the other colleges, in addition to all facilities administered by the Claremont College Consortium. Any student attending Pitzer can enroll in classes at the other four colleges, and can complete an off-campus major if the major is not offered by Pitzer. Pitzer offers 41 majors and 22 minors, many of them cross-disciplinary, and each student is assigned a faculty advisor upon his/her arrival on campus. The College expects students to take an active part in planning that course of study, and has few distribution requirements. The student/faculty ratio is 10:1, and 100% of Pitzer's tenure-track faculty hold a PhD or the terminal degree in their field. The college operates 58 study abroad programs, including 41 international exchanges and 6 domestic exchanges. Pitzer College also operates its own study abroad programs in Botswana, Costa Rica, Ecuador, Italy and Nepal. From 2010-2015, The Chronicle of Higher Education listed Pitzer first in Fulbright Fellowships among all undergraduate institutions nationwide. In 11 of the past 12 years, Pitzer received more Fulbright Fellowships per capita, than any other college or university nationwide. Pitzer offers a Secularism major. In the decade preceding 2007, Pitzer College saw its admission rate drop by 41%, and it has continued to fall. Pitzer College is a member of an elite group of 20 Liberal Arts colleges that are the most selective in the United States. In 2018, Pitzer received 4,358 applications for admission to the class of 2022 and offered admission to just 13.2% of those who applied. The average high school G.P.A. of the class of 2022 is 3.97. Among the students admitted to the class, 61% came from outside California, including 10.6% from outside the United States. 44.2% identified as people of color. In 2004 Pitzer became the first college on the West Coast to join the SAT-Optional Movement by making the SAT optional for applicants with a cumulative unweighted high school GPA of 3.50 or higher. Pitzer College enrolls approximately 1000 students, making it the third largest of the five undergraduate Claremont Colleges (Claremont McKenna and Pomona have larger student bodies, while Harvey Mudd and Scripps are smaller). Pitzer College ranks 25th nationwide among all Baccalaureate Colleges for percentage of its students who study abroad, and Pitzer has the highest rate of study abroad among the Claremont Colleges. Students of color constitute over 30% of the total student body and Pitzer enrolls the largest number of international students of any school within the Claremont Consortium. The Pitzer College community is known for its involvement outside of the classroom. Its students, faculty, and staff donate over 100,000 hours to community service annually. The College has been named to the President's Higher Education Community Service Honor Roll seven times. Much of Pitzer's community engagement occurs in the Community Engagement Center (CEC). The CEC runs the Pitzer in Ontario Program, a comprehensive semester-long service learning and cultural immersion program with a strong theoretical foundation in the human sciences informed by the best practices in the field of experiential education. The program integrates extensive internship experiences in city, private or non-profit organizations with interdisciplinary coursework that provides the theoretical framework from which social and urban issues can be effectively evaluated. Through living in Ontario, students have the opportunity to engage firsthand the diversity of voices, perspectives, and agendas that are driving those demands, and to come to a better understanding of the many layers of engaged citizenship. At the Campus Compact 20/20 Visioning Summit on October 17, 2006, the Corporation for National and Community Service recognized Pitzer as one of 28 California campuses distinguished for community service and Hurricane Katrina relief efforts. Pitzer College received Mother Jones Magazine 2006 Campus Activism for Thinking Outside of the Box. Pitzer College students including former Speaker of the California State Assembly Fabian Nunez '97 helped in founding the Pomona Economic Opportunity Center. Through the Community Engagement Center, dozens of Pitzer students volunteer each semester with programs at Camp Afflerbaugh and California Youth Authority Chino. Kohoutek Music and Arts Festival began in 1974 and is a student-run multi-day outdoor music and arts festival held each spring on the Pitzer campus. The event, which is free and open to all Claremont Colleges community members, is named after Comet Kohoutek, discovered by Czech astronomer Lubos Kohoutek. Past groups that have headlined Kohoutek include: O.A.R, Blackalicious, The Roots, Tea Leaf Green, Breakestra, Zolar X, Lyrics Born, Akron/Family, Zion I and Toubab Krewe. Last year's headliners were Matt & Kim, Blu and Mr. Lif and featured a performance by special guests Mandrill. The festival generally includes a number of non-music components including off-campus and student vendors, fire performances, a farmers market, and other activities. Groove at the Grove: refers to those concerts or other performances held on Thursday nights at the Grove House, but the term may be used at other times as well. The event represents Pitzer's most consistent contribution to the weeknight arts and music scene at the Claremont Colleges. Acts set up on the front steps of the Grove House with the audience standing immediately in front of the structure. Numerous student and professional groups have performed at the event, including We Are Scientists. Hammocks on The Mounds: refers to the hanging of hammocks on the Pitzer Mounds, the uneven grassy area located directly north of McConnell Center. The hammocks are generally donated by students and/or alumni, or purchased by the student government. Orientation Adventure or OA is the College's pre-Welcome Week program for incoming First-Year, Transfer, and New Resource students. The program offers multi-day thematic trips throughout California, led by student leaders. Over the program's history themes have included backpacking, sustainability, coastal biking, grassroots movements, surfing, and Los Angeles arts & music. Trips generally vary in length from three to four days and destinations of past trips have included: Sequoia National Park, Kings Canyon National Park, Chávez National Center, San Gabriel River Trail, Newport Beach, Los Angeles, San Onofre, community gardens, and San Diego. Murals provide unique visual atmosphere to Pitzer college. Murals are painted by students, staff, and guests artists on the interiors and exteriors of campus buildings. Diverse themes include portraits, politics, literature, and purely whimsical imagery. Snackie Snack occurs weekly, and is a free late-night snack served by the Pitzer Activities (PAct) Programming Board. During exam periods, Snackie Snack is served by the president and members of the cabinet. "Reggae Fest" began in 2003 as a fall concert event. Sometimes referred to as "BobFest", the event occurs during the first weekend in November and features Reggae, Dancehall, Afrobeat, and World music. The festival runs over the course of a single day and features 5-9 live, professional bands, free food and beverages. The event has been hosted by California reggae personality Junor Francis each year since its inception. The Pitzer College Student Senate is the central governing body for the students at the college. In total, Student Senate is composed of 55 members: including the Executive Board (President, Vice President, Secretary, Communications Secretary, and Treasurer); Legislature (40 senators); and the Judicial Council (10 justices). All positions on Student Senate are either elected by the Student Body or appointed by the Executive Board. Student Senate meets weekly during the academic year. West and East Halls at Pitzer College were completed in 2012. The majority of Pitzer students live on campus in one of five residence halls: Atherton Hall, East Hall, West Hall, Mead Hall, Pitzer Hall and Sanborn Hall. Each hall is equipped with laundry rooms, common rooms for meetings or social gatherings, study rooms, full kitchens and has a full-time in-residence hall director. All Pitzer residence halls, balconies included, are non-smoking. Through the Faculty in Residence Program, each year two members of the Pitzer faculty live in one of the two faculty apartments in the residence halls on campus, and design and run events for students. The assistant dean of students also lives on campus. First- and second-year students are not permitted to bring cars to campus, although exceptions can be made on a case-by-case basis. Atherton Hall is a four-story building adjacent to the Gold Student Center. Atherton accommodates 62 students. Rooms are double occupancy with two rooms sharing an adjoining vanity, bathroom and shower. Common areas include a living room, six study rooms, and laundry facilities. The basement level of Atherton Hall is home to the mailroom, a music practice room, the Lenzner Family Gallery, art studio with classroom, and the Writing Center. Pitzer Hall is a four-story building southeast of the Gold Student Center that houses 78 students. Rooms are double occupancy, with two rooms sharing an adjoining vanity, bathroom and shower. Common areas include a living room, eight study rooms, and laundry facilities. The first floor houses the Office of Admission. One of the two Faculty in Residence apartments is also in Pitzer Hall. Sanborn Hall is a two-part three story building east of the Gold Student Center. Sanborn houses 178 students. Rooms are double occupancy with two rooms sharing an adjoining vanity, bathroom and shower. Common areas include a living room, nine study rooms, laundry facilities and a kitchen. One of the two Faculty in Residence apartments is also in Sanborn. West and East Halls are made up of four buildings that house 300 sophomores, juniors and seniors in suite-style living. Opened in fall 2012, West and East Halls are the newest residential living areas on Pitzer's campus. Living in W.E. Halls is set on the northwest part of campus. W.E. Hall has 67 suites that have two double-occupancy rooms with a shared bathroom. There are also ten suites that have four single rooms with a shared bathroom and common room. Only junior and seniors are eligible to live in single rooms. Mead Hall is a three-story, six-tower complex which houses 225 students. Each suite shares a common living room with four or eight residents in each unit. Common areas include a community kitchen, laundry facilities and a television lounge. Mead is home to Career Services, Center for Asian Pacific American Students, The Rabbit Hole (substance abuse education and outreach program), the Marquis Library, and the Writing Center. This hall offers a Substance Free Tower and a Community Involvement Tower that exemplifies one of the college's educational objectives: awareness of the social and ethical implications of action. Residence life in the Involvement Tower is generally self-governed within the parameters of Pitzer's residential life policies, subject to amendment by Pitzer College Student Senate. Students are required to attend Tower meetings and participate in Pitzer's community or the community at large. Pitzer students also participate in the Claremont Colleges club sports programs that compete nationally. Originally opened in 1995, the Gold Student Health and Wellness Center was completely renovated and reopened in 2014. It is a hub of campus life activity for the entire Pitzer community. The Center is home to the College's gym, a yoga studio, a Pilates studio and the student-run Shakedown Café. There is also incorporated club meeting space, multipurpose programming space, and the offices of some Student Affairs staff. The Residential Life Project is expected to be completed in three phases over the next 10 to 15 years. Phase I, which included Sanborn, Pitzer, and Atherton Halls, was completed and inaugurated in September 2007 and received LEED Gold recognition from the United States Green Building Council in 2008. Robert Redford and Ed Begley, Jr. were the keynote speakers at the dedication ceremony of the Residential Life Project. The College broke ground on Phase II, which incorporates four new residence halls, a demonstration kitchen, an archive, a board room and program/faculty offices, in December 2010. It was completed in 2012 and earned LEED platinum certification. When Pitzer's Residential Life Project is complete, the College expects to become the first college in the nation to have all Gold or Platinum LEED certified residence halls. Pitzer has more than 50 student clubs and organizations on campus, in addition to over 200 others within the Claremont Colleges consortium. The Green Bike Program (GBP), a student run bicycle collective, maintains a full service shop, as well as fleet of recovered and reused bicycles that are raffled off free of charge each semester for student use. The GBP works to provide an alternative mode of transportation to combat the predominant and destructive car culture in Southern California, as well as to reduce consumption and consumerism while increasing the practical use of recycled and reused materials. The GBP maintains a strong DIY ethic, and has become a social hub for both student and community activism. The school's athletic program participates, in conjunction with Pomona College (another consortium member) and are named Pomona-Pitzer. The teams participate in NCAA Division III in the Southern California Intercollegiate Athletic Conference. Once known as the Huns, the school's sports teams are now called the Sagehens with their mascot being named Cecil the Sagehen. Their colors are blue and orange. The Pomona-Pitzer Sagehens ranked 19th among all Division III schools and second among SCIAC schools in the 2016-2017 Learfield Sports Directors' Cup Division III Final Fall Standings, which ranks athletic programs and awards points relative to their finish in NCAA Championships. There are 21 men's and women's teams. The other sports combination of the Claremont Colleges is the team made up of Claremont McKenna College, Harvey Mudd College and Scripps College known as Claremont-Mudd-Scripps Stags and Athenas (CMS). For the 2015-16 academic year, tuition is $48,400, a double room is $8,770, the 16-per-week meal plan is $6,440. About thirty-seven percent of Pitzer students receive financial assistance in loans, work study, scholarships, and/or institutional grants. Pitzer utilizes the Federal FAFSA and the CSS Profile to determine financial need, and Pitzer has stated a commitment to meeting 100% of every student's demonstrated financial need. The average financial aid package at Pitzer is $40,250. Since 2004, the College has significantly reduced the average amount of indebtedness of its students to $19,422, well below the national average of more than $35,000. Pitzer's Office of Admission states a commitment to building a student body that "reflects a wide range of economic, ethnic, racial and geographic representation." Jonah Matranga 1991, singer-songwriter and musician, former frontman for Far and Gratitude. Nigel Boyle, Political Studies – Expert in comparative politics, European social policy, labor market policy, Irish politics, soccer and politics. Recognized by the Fulbright Scholarship Board as the top Fulbright adviser. Halford Fairchild, Psychology and Black Studies. Carmen Fought, Linguistics – Expert in phonology, bilingual language acquisition, sociolinguistics. Has frequently discussed linguistic issues on multiple media outlets. Stephen L. Glass, John A. McCarthy Professor Emeritus of Classics, longest-serving faculty member of the College from 1964-2011. Judith Grabiner, Mathematics, history of mathematics and science. Awarded the 2014 Beckenback Book Prize for her book A Historian Looks Back: The Calculus as Algebra and Selected Writings (MAA Spectrum, 2010); Inaugural member of the 2012 Fellows of the American Mathematical Society. Jemma Lorenat, Mathematics, history of mathematics and science. Awarded the Montucla Prize of the International Commission for the History of Mathematics in 2017. David Moore, Psychology, Director of the Claremont Infant Study Center and winner of the American Psychological Association's 2016 Maccoby Book Award for The Developing Genome: An Introduction to Behavioral Epigenetics (2015). Adrian Pantoja, Political Studies and Chicano Studies – his research has appeared in numerous books and academic journals and works as a consltant to the National Association of Latino Elected Officials. His is also a senior analyst with Latino Decisions, a political polling firm surveying and analyzing the Latino electorate. Gregg Popovich, men's basketball coach 1979-1986, 1987-1988. Dana Ward, Emeritus Professor of Political Studies - Founder of the Anarchy Archives, Executive Director of the International Society of Political Psychology (1998–2004). Kathleen Yep, Asian American Studies and Chair, Intercollegiate Department of Asian American Studies at The Claremont Colleges. Honored in 2015 for promoting literacy in the Los Angeles Community. Phil Zuckerman, Sociology and Secular Studies; expert in secularity, atheism, apostasy, and Scandinavian culture. Author of several books including Living the Secular Life (2014). Frequent contributor to the Huffington Post and sought after commentator for discussions on secularism by multiple media outlets. ^ As of June 30, 2017. "Audited Financial Report" (PDF). Pitzer College. ^ "Pitzer College 2017 990 Form" (PDF). Guidestar. Retrieved 25 September 2018. ^ a b "Common Data Set 2015-2016" (PDF). Pitzer College. ^ "About Pitzer". Pitzer College, Office of Admission. Archived from the original on 2007-10-18. Retrieved 2007-10-22. ^ "Pitzer College History - Pitzer College". Pitzer College. Archived from the original on 2015-12-27. Retrieved 2016-01-13. ^ Watanabe, Teresa (January 13, 2016). "New Pitzer College president is first African American to lead a Claremont undergrad campus". Los Angeles Times. Retrieved 2016-10-08. ^ "Melvin L. Oliver: Pitzer College's 6th President". Melvin L. Oliver. Archived from the original on 2016-01-16. Retrieved 2016-01-13. ^ "Pitzer College's New LEED-Certified Residence Halls Win Design Award". Office of Communications. Archived from the original on 2015-03-31. Retrieved 2016-01-09. ^ "Campus Map". Robert P Hernandez. Archived from the original on 2008-12-18. Retrieved 2007-10-22. ^ "Board of Trustees - Pitzer College". Pitzer College. Archived from the original on 2016-01-10. Retrieved 2016-01-13. ^ "The Grove House". The Grove House. Retrieved 2016-01-13. ^ "The John R. Rodman Arboretum - The John R. Rodman Arboretum". The John R. Rodman Arboretum. Archived from the original on 2016-01-04. Retrieved 2016-01-13. ^ "map - Pitzer College". Pitzer College. Archived from the original on 2016-01-03. Retrieved 2016-01-09. ^ "Pitzer College | Café Bon Appétit". pitzer.cafebonappetit.com. Retrieved 2016-01-13. ^ "Robert J. Bernard Biological Field Station". bfs.claremont.edu. Retrieved 2016-01-13. ^ "Outback Preserve at Pitzer College - The John R. Rodman Arboretum". The John R. Rodman Arboretum. Archived from the original on 2015-12-22. Retrieved 2016-01-13. ^ "Joint Science Costa Rica Field Station". Donald A. MacFarlane. Retrieved 2007-10-22. ^ "Pitzer in Costa Rica - Study Abroad and International Programs". Study Abroad and International Programs. Archived from the original on 2016-01-08. Retrieved 2016-01-13. ^ "National Liberal Arts College Rankings | Top Liberal Arts Colleges | US News Best Colleges". colleges.usnews.rankingsandreviews.com. Retrieved 2016-01-13. ^ "Most Students Studying Abroad | Rankings | US News Best Colleges". colleges.usnews.rankingsandreviews.com. Retrieved 2016-01-13. ^ "High School Counselor Rankings | Liberal Arts Colleges | US News Best Colleges". colleges.usnews.rankingsandreviews.com. Retrieved 2016-01-13. ^ "Best Colleges for Veterans | Liberal Arts Colleges | US News Best Colleges". colleges.usnews.rankingsandreviews.com. Retrieved 2016-01-13. ^ "Top 100 – Lowest Acceptance Rates | Rankings | US News Best Colleges | page 2". colleges.usnews.rankingsandreviews.com. Retrieved 2016-01-13. ^ "Pitzer College - Campus Food". Niche.com. Retrieved 2016-01-13. ^ "Which Is the Greenest College Campus in Your State? | EarthTechling". EarthTechling. Retrieved 2016-01-13. ^ "Hidden Gems: The Best Colleges In Each State That Receive Fewer than 5,000 Applications Per Year - College Raptor Blog". College Raptor Blog. Retrieved 2016-01-13. ^ "Pitzer College Named a "Most Service-Oriented Schools" by Newsweek". Office of Communications. Archived from the original on 2016-03-04. Retrieved 2016-01-13. ^ N/A, N/A. "Majors and Minors". Pitzer College Majors and Minors. Pitzer College. ^ a b "Pitzer College at a Glance". Pitzer College. Archived from the original on 2015-12-21. Retrieved 2016-01-13. ^ "Office of Study Abroad and International Programs - Study Abroad and International Programs". Study Abroad and International Programs. Archived from the original on 2016-01-05. Retrieved 2016-01-13. ^ "Pitzer College Named #1 Fulbright Producer for Fifth Straight Year". Office of Communications. Archived from the original on 2016-02-29. Retrieved 2016-01-13. ^ "Student Awards". Pitzer College. Archived from the original on 2016-03-04. Retrieved 2016-01-13. ^ "Pitzer College Students and Alumni Awarded 21 Fulbright Fellowships". Office of Communications. Archived from the original on 2015-09-08. Retrieved 2016-01-13. ^ "Secularism as a major? Pitzer College believes in it". Archived from the original on 18 April 2012. Retrieved 12 May 2011. ^ Goodstein, Laurie (8 May 2011). "Pitzer College in California Adds Major in Secularism, starting in fall 2011/2012". The New York Times. Retrieved 12 May 2011. ^ Ding, Jaimie (13 April 2018). "5Cs Release Class of 2022 Admissions Decisions". The Student Life. ^ Schevitz, Tanya (7 April 2007). "Small colleges raise the bar on admissions". SFGate. Retrieved 23 May 2018. ^ "2017 Admitted Students Profile". www.pitzer.edu. 2017 Admitted Students Profile. Retrieved 23 May 2018. ^ "Pitzer College Makes SAT Optional". FairTest. ^ "Office of Institutional Research & Assessment - Institutional Research & Assessment". Institutional Research & Assessment. Archived from the original on 2016-01-06. Retrieved 2016-01-13. ^ "Pitzer College Honored for Commitment to Community Engagement". Office of Communications. Archived from the original on 2015-11-05. Retrieved 2016-01-13. ^ "Community Engagement Center - Community Engagement Center". Community Engagement Center. Archived from the original on 2015-12-21. Retrieved 2016-01-13. ^ "Pitzer in Ontario - Pitzer in Ontario". Pitzer in Ontario. Archived from the original on 2016-01-16. Retrieved 2016-01-13. ^ "Extra Credit: Campus Activism 2006". Mother Jones. Retrieved 2016-01-13. ^ "Top 10 Activist Campuses". Mother Jones. Retrieved 2016-01-13. ^ "Pomona Economic Opportunity Center - Community Engagement Center". Community Engagement Center. Archived from the original on 2015-12-06. Retrieved 2016-01-13. ^ "Security Check Required". www.facebook.com. Retrieved 2016-01-13. ^ "Orientation Adventure". Pitzer College. Archived from the original on 2015-12-25. Retrieved 2016-01-13. ^ "Murals and Outdoor Art". Flickr - Photo Sharing!. Retrieved 2016-01-13. ^ "Pitzer Activities (PAct)". Pitzer College. Archived from the original on 2016-01-18. Retrieved 2016-01-13. ^ "Housing". Pitzer College. Archived from the original on 2016-01-27. Retrieved 2016-01-13. ^ "College Housing". Office of Student Affairs. Archived from the original on May 13, 2007. Retrieved October 23, 2007. ^ "Pomona Pitzer". www.pe.pomona.edu. Retrieved 2016-01-13. ^ "Gold Student Health & Wellness Center". Pitzer College. Archived from the original on 2016-01-24. Retrieved 2016-01-20. ^ "Residence Halls at Pitzer College Receive Gold LEED® Certification by the U.S. Green Building Council". Office of Communications. Archived from the original on 2016-08-19. Retrieved 2016-01-13. ^ "Pitzer College First among Liberal Arts Colleges with Eight LEED Mixed-Use Residential Buildings". Office of Communications. Archived from the original on 2015-03-31. Retrieved 2016-01-13. ^ "Planning Documents - Institutional Research & Assessment". Institutional Research & Assessment. Archived from the original on 2016-03-04. Retrieved 2016-01-13. ^ "Student Organizations - Student Senate". Student Senate. Archived from the original on 2016-01-12. Retrieved 2016-01-13. ^ "2016-17 Learfield Sports Directors' Cup Division III Final Fall Standings" (PDF). ^ "Pomona Pitzer" Retrieved 21 January 2017. ^ "Tuition and Fees - Office of Financial Aid". Office of Financial Aid. Archived from the original on 2016-01-26. Retrieved 2016-01-13. ^ "Financial Award Information - Office of Financial Aid". Office of Financial Aid. Archived from the original on 2016-01-28. Retrieved 2016-01-13. ^ "Internet Movie Database -David Bloom". IMDB.com. Retrieved 2007-01-15. ^ "Internet Movie Database -Brooke Breton". IMDB.com. Retrieved 2018-07-16. ^ "j. lately - 2DOPEBOYZ". 2dopeboyz.com. ^ "Dee Mosbacher, Nanette Gartrell". The New York Times. January 16, 2005. Retrieved December 19, 2018. ^ "Mike Simpson". Mike Simpson. 2014-06-28. Retrieved 2014-08-17. ^ "Gibson, Dunn, & Crutcher LLP - Debra Wong Yang". GibsonDunn.com. Retrieved 2007-11-01. ^ "Nigel Boyle, Associate Dean for Global and Local Programs". Academics. Archived from the original on 2016-03-04. Retrieved 2016-01-13. ^ "Carmen Fought, Professor of Linguistics". Academics. Archived from the original on 2016-01-30. Retrieved 2016-01-13. ^ "Stephen L. Glass - Academics". Academics. Archived from the original on 2016-04-13. Retrieved 2016-01-13. ^ "Judith V. Grabiner, Professor of Mathematics". Academics. Archived from the original on 2016-01-14. Retrieved 2016-01-13. ^ "Report Montucla Prize 2017". ICHM. Retrieved 2018-11-29. ^ "David Moore - Academics". Academics. Archived from the original on 2015-11-27. Retrieved 2016-01-13. ^ "Adrian Pantoja, Political Studies/Chicano Studies". Academics. Archived from the original on 2015-12-31. Retrieved 2016-01-13. ^ "Kathleen Yep - Academics". Academics. Archived from the original on 2016-03-04. Retrieved 2016-01-13. ^ "Professor Kathleen Yep Honored with Mayor's Award for Promoting Literacy in LA Community". Office of Communications. Archived from the original on 2016-02-26. Retrieved 2016-01-13. ^ "Phil Zuckerman, Professor of Sociology". Academics. Archived from the original on 2015-12-03. Retrieved 2016-01-13.